A place to think, reflect, and talk (mostly to myself) about books I love…and a few that I don't. …until Grace’s will reveals that not only are they part of a larger family, but it’s, well, HUGE! (Not to mention the most powerful in human history.) But before Dan and Amy can get too cuddly, they also find out that there’s a family feud stretching all the way back to Gideon Cahill and his quarrelsome kids in the 1500s that splits the Cahills into four branches. What’s more, they discover that a secret formula lies at the root of the feud—and it’s up to them to find all of the clues before anyone else can. Book 1, The Maze of Bones by Rick Riordan, sets the siblings off on a globe-trotting trek to uncover Gideon Cahill’s greatest secret. Filled with action, adventure, geographic thrills, and spine-tingling chills, the series continues in the 9 following volumes, each written by a different author (incl. Gordon Korman, Patrick Carman, Jude Watson, Linda Sue Park and several more). Dan and Amy’s story picks up again in series two, Cahills vs. Vespers, with an intermediate novel to bridge the gap, Vespers Rising. I recommend beginning with series one, book one, and working your way up. So far, only two books have been published in the Cahills vs. Vespers series, with book three, The Dead of Night, due out March 6. 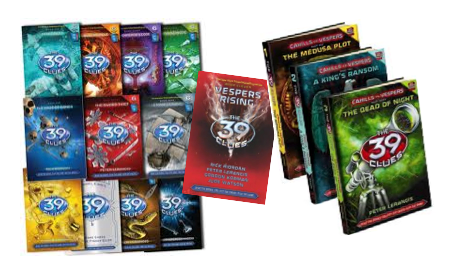 I was first introduced to the 39 Clues when I was asked to participate in the creation of some materials for a webcast featuring Ruth Culham—with whom I worked closely on the Scholastic Traits Writing program—and the 39 clues. (You can find the materials I helped generate here.) The webcast and worksheets were designed to get kids examining text and excited about writing by introducing them to the Traits and helping them discover in favorite/familiar books models and mentors for their own work. While I didn’t have to read them all, after book one I found I had quite a fondness for Dan’s quirky character and Amy’s burgeoning sense of self-confidence. Their characters are really lively and well done—and despite the variety of authors, surprisingly consistent. I wound up reading 6 of the 10, and was pleased to revisit their world in the second series this past January when I was asked to participate in another related project. The idea is really stellar and complex (despite some implicit/inadvertent eurocentrism) and the adventures are fun—the pace is nothing if not quick. 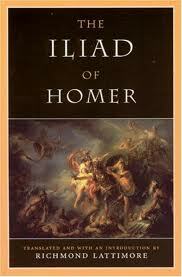 Historical figures, bits of world cultures and geographic trivia are laced innocuously throughout. I was surprised myself, after the fact, to reflect on how much I had accidentally learned from the series about peope, places, and things I had thought I was quite knowledgable about. Coupled with the interactive website, there’s a lot for unsuspecting reluctant-reading minds to glean. The writing is simple, fairly transparent, and there’s a somewhat “Nancy Drew” quality to Dan and Amy’s sleuthing and often predictable resolutions (which is one reason I didn’t press on to read the final four titles). But the series mixes it up – not always allowing Dan and Amy the spotlight OR the victory outright. Because the Cahill family is so large, there is a vast cast of multicultural characters to meet (though none of them is ever very deeply developed) and the 3rd-person perspective switches up regularly, providing lots of twists and turns. Not deep or heavy by any means, often overly simple for the older reader in me, these are nonetheless fun, light, catching reads that could serve for the kid-at-heart as a good buffer between dark apocalypses and epic fantasies. Something like Spy Kids meets Carmen Sandiego turned print—though generally less cheesy and far more complex. The books had me clue-hunting right along with the Cahills, curious to find out how it would all wrap up in the end. I definitely recommend these book for the 9-12-ers—who I’ve witnessed can get really NUTS for these things!—as well as for the adventurous 13+(+++)-er. 10 New Books Every Tuesday! What are YOUR top 100 children's books? How about YOUR #1? Click here to read about 100 Greatest Books for Kids countdown by Scholastic's Parent & Child Magazine and enter your choices for a chance to win a copy of one of the titles in your preferred age group. Written around the 8th Century BC, this epic Greek poem about the Trojan war has influenced countless classic authors with its tragic and quintessential tale of hubris, love, and war. With hunks like Achilles and Odysseus, hotties like Helen, and powers that be like Ares, Apollo, and Aphrodite, it's no wonder this book is also prime inspriation for today's YA otherworldly writers. Here are some titles that I highly recommend, but haven't had a chance to review (quite) yet.